The consultant’s report from 2009 is now online available for viewing. 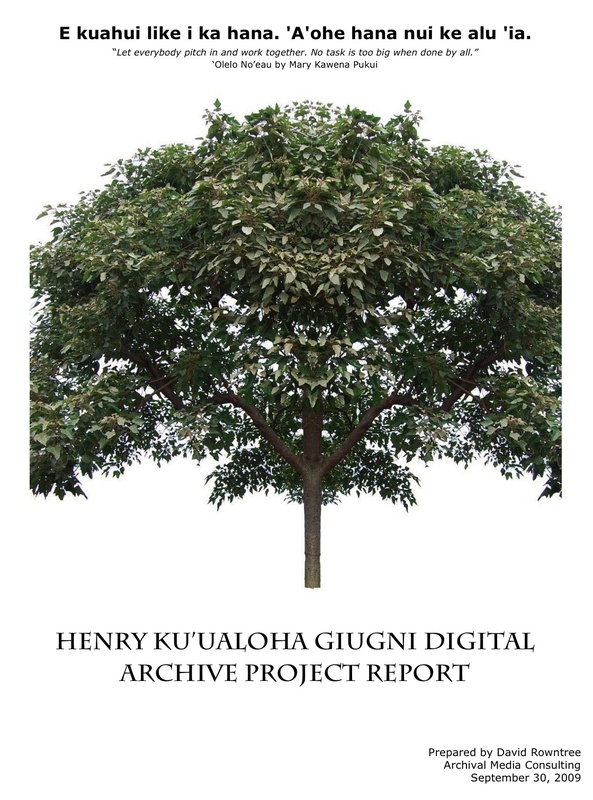 I am happy to announce that the “Henry Ku’ualoha Giugni Digital Archive Project Report” has been completed. The report looks at the status of moving image preservation in Hawai’i, highlighting the urgency for action. The report also provides some guidelines that are to act as a “blueprint” for the establishment of a new archive and program. A survey was also conducted and is included in the report. I want to thank the many people involved who very generously gave of their time and insights. It has been a month already since I left Hawaii, yet I often reflect about the great meeting we had. It was wonderful to see those of you whom I met on my first trip, and a pleasure to meet many of you for the first time. What a great photo! A few of you have asked for a copy of my Powerpoint presentation. I was hoping I could upload it to this blog but I do not think I am able. If you still want a copy please email me feluccafilms@gmail.com and I will be happy to send it to you. Mahalo for a great time. A few people have been having problems advancing pages while taking the survey. Below is the response I received from Survey Monkey tech support… It seems that people were timing out of their browsers because the questions were taking too long. Therefore, I have reduced the number of questions on each page to try and speed up the process. If you are still having problems advancing pages, try to refresh your browser page. If this does not work please feel free to email your answers directly to me and I can manually add them. Sorry for the inconvenience. I appreciate you taking the time to fill out the survey. I think the issue is most likely related to the length of your survey pages. If you break the survey into more pages, then it will be easier for respondents to get past a given page without having their Browser time out. Keep in mind that surveys are displayed in a Browser window, so if you design a page of the survey to be long enough that respondents are spending more then 5 minutes on the page without refreshing it, then you should start breaking it up into more pages. For those of you who will be attending please take the time to go to the Natsunoya Tea House website. Please email me at feluccafilms@gmail.com to let me know if you would like the Veggie or the Tea House Special bento selection. The last general survey of the audiovisual holdings in Hawai`i was conducted 20 years ago. “The Hawaii Moving Image Preservation Project Report” was written by Ruth Tamura in 1989-1991. The report consisted of 90-pages and 43 appendices totaling approximately 400 pages. However, the report focused only on the holdings within Hawaiian State institutions and departments and more specifically on film pre-dating 1960. This limited survey of Hawaiian cultural institutions, in addition to the monumental paradigm shift brought about by digital technologies justifies the need for a new survey. Rapid technological advances, combined with the almost equally rapid obsolescence of moving image playback equipment, has changed the types of audiovisual materials being created, as well as the priorities for preservation. As I mentioned in my last post, the genesis of this survey has come from my initial research and meetings for the HKG Archive. Knowing that it would be impossible to visit and talk with every archive, library, independent filmmaker, and cultural organization that held moving image materials I have developed a short questionnaire to reach a larger number of people. Obtain some basic information about the state of moving image collections throughout Hawai`i (with a particular emphasis on Hawaiian materials) from a variety of public and private organizations, institutions, and individuals. Identify the level of digitization efforts and initiatives that currently exist in Hawai`i. Collect opinions about the various challenges organizations face in preserving and making accessible their collections. I am optimistic that the information gathered in the survey will provide valuable information and help to understand the scope of the challenges in Hawai’i as well as provide accurate figures to develop a sustainable long-term preservation plan for these valuable materials. The survey should take approximate 20-30 minutes to complete. Please take the time to fill in the survey as accurately as you can. If you have any questions about the survey please contact me at feluccafilms@gmail.com . Or leave questions in the comments section of the blog. I will publish the results of the survey on this blog. Thanks for your help! It’s been just over two weeks since I’ve returned from the first of two visits to Hawai`i. Looking back I can confidently say it was an incredibly productive, insightful, and enjoyable trip. I had a full schedule of meetings with people over the course of two and a half weeks and visited three islands in the process. I am very grateful to Heather Giugni for helping with initial introductions and to everyone who I met for being so generous with both their time and knowledge. The list of the people and places I visited represents a small proportion of groups I would like to reach. Initially, I had planned to meet and talk to people as part of my background research. I wanted to get an understanding of the kinds of audiovisual materials that existed in Hawai`i, an idea of the amounts, if they were being preserved, digitized, and if they were accessible. It became clear that many people were interested in seeing the results of my interviews and wanted to know themselves exactly the status of Hawaii’s moving image heritage. Therefore, I felt that it would be a good idea to expand my initial project and try to conduct a larger more comprehensive survey. This is the subject of my next posting. While I expected that most people would agree there was a growing need to address preservation of old media formats, I was surprised at the level of excitement and commitment from the people I spoke with. In general, there was a cautious optimism as many voiced a “wait and see approach.” A natural reaction given that the Archive does not yet exist. Nonetheless, there was universal agreement that the creation of the HKG Archive would be a positive stp forward.